Farm in the Cave invites participants of the Prague Visitor's Programme into the rehearsal room for an encounter with the creators of the company’s upcoming project, which will premiere on 4.6.2018 at the DOX Centre for Contemporary Art as part of the Tanec Praha Festival. Without set or lights, participants will get a behind-the-scenes look at International Theatre Studio Farm in the Cave’s creation process in its new home at DOX, where the company is in residence. International theatre studio Farm in The Cave focuses on the creation, development and research of human expression. Farm in the Cave’s performances are born of a long-term research that address the transmission of human experience beyond words and limits of ordinary understanding. 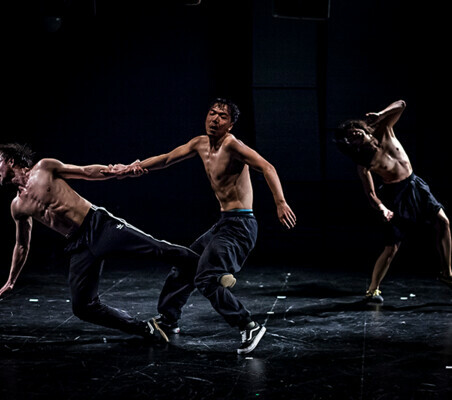 The work of the company, under the leadership of director and choreographer Viliam Dočolomanský, has long been based on exploring uncomfortable contemporary themes that society refuses to see. The DOX Centre for Contemporary Art is a multi-functional space, created thanks to a private initiative for the reconstruction of a former factory in Prague’s Holešovice district. DOX’s programme differs from other similar exhibition institutions (the connection of a “kunsthalle” with a multifunctional cultural centre) primarily through art projects incorporating critical reflection on current social themes and issues overlapping with other “non-artistic” areas and disciplines such as psychology, philosophy, history, sociology and political science. DOX emphasises exchanges and interconnections between artistic disciplines — from painting to photography, to design, architecture, performance, physical theatre and film.